French gardens are formal and are highly organized. 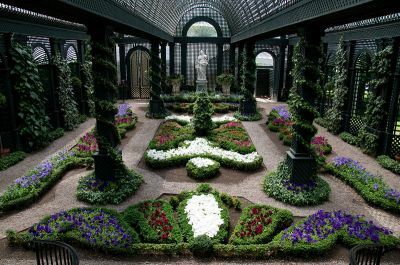 The design of this type of garden is characterized by classical geometric shapes and symmetrical grids that were inspired from Roman architecture. They are usually found in large houses, hotels, theaters. However, during the time this garden style was developed, it was then an extension to the chateau which its surrounds. The garden then signifies wealth, power and royalty. Hence, this garden type was commonly used in the country homes of English nobles. In this type of garden layout it is common to see a labyrinth, a hedge maze and a topiary resembling plants, animals or shapes. This may also include fountains, sculptures, aviaries and menageries which showed of the abundant wealth of its owners. As mentioned earlier, the geometric design of this garden is one of its unique features. Shrubs and bushes were planted to form hedges following shapes such as squares, triangles, rectangles and circles. The middle of the hedges is planted with lawn grass, flower beds, vegetables or herbs of your paying respect to the color scheme of the entire garden. The plants commonly used are a variety of green foliage. From small shrubs to tall hedges, green is the recurring theme here dotted with the colors of flowers. Pastel colors and those with the shades of red, yellow, blue and lilac are used commonly. However, these plants are not left to grow in the same place for longer than a season. Only the hedges are kept in place. The rest of the flowers, vegetables and herbs are uprooted very season. French gardens features water fountains, cascades, pools and canals with bridges. The presence of flowing water creates a cooling effect to the garden as cool air follows the current of the water. It brings in a good and enjoyable atmosphere to the garden. These are situated in vast expanses of land. If the garden is divided into different sections, pathways are that connect one section or element to another are placed. The pathways are made from stones laid on the ground. It is also lined with hedges pr vine-covered trellises along the side. Trees and ornaments like sculptures, statues, columns birdbaths and sundials may also flank the path way. Traditional French themed gardens also have a terrace that overlooks the garden. Others have a gazebo made with cobblestones and artfully placed wrought iron benches, chairs and tables that is perfect for an afternoon tea while you enjoy the scenic view of the garden. Some French gardens also have an orangerie. This is a structure similar to a greenhouse except that it is not green but just clear glass and is lines with a variety of citrus plants. This place is a good place to enjoy the garden during winter. These gardens are well-kept. They are carefully maintained. Most designs are a product of their owners’ way of life and the nurturance of its gardener. The result is the effect of the control and manipulation of the gardener versus the ways of nature..